CharkBait! Internet Sportfishing The CharkBoards! Forums Tackle Talk New Gear PRO GEAR IS BACK! Ishi is back at the helm, ProGear reels are back in production! 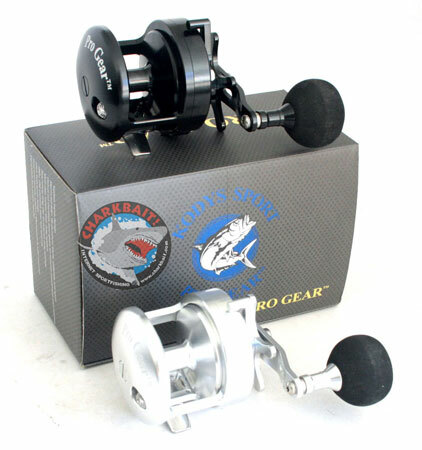 These were the best star drag reels on the market back a few years ago. They went away, and now have returned to the market. They are produced here in California, feature an excellent anti-reverse system using both dogs and one way bearing, high drag capability and now are offered in sizes which reflect the advantages of new super braided lines. Check the Weekly Special's page for additional information. We'll post them on their own page on our site over the next week. A couple of questions, and they're NOT a rush. First, if you do a video, please tell us whether the new PGs ship with an adequate amount of lube inside. If they don't, along with spooling up, you might offer a hefty dab of suitable grease. Are the drag disks shipped wet or dry? Arguments over the virtues of wet or dry drags get absolutely theological in their ferocity. I don't care, but I'd like to know what the manufacturer recommends. On the East Coast, I have no occasion to fish a substantial topshot of monofilament. What would the capacity of these reels be if you wanted just a few yards of mono, and otherwise a load of solid braid? The V-50 sounds approximately 4/0 in capacity. I infer from the announcement that smaller reels are also in the pipeline - but not too soon. Am I correct? Finally, it appears that the crank can be extended by removing the nut and backing plate. Chark, are you sure they're being produced in California? Yes, handle position can be changed so there's more cranking leverage. And, yes two more reels coming, smaller in size. Those should be finished this week and with a bit of luck will be here by Friday - that's my hope, would like to get those shot and posted. They are kind of a tweener sized between an Avet SX and MX, one model narrower than the other like the 40/50 in that respect but more of a change in relative width. Country of origin, Taiwan - and that's not a bad thing. Taiwan is the equal of Japan in terms of precision manufacturing. Their company hq is in Temple City. Quality of manufacture is very good, nothing at all like SoCal Reels in terms of feel - those are horrible in all respects. In the world of Chinese manufacture, the plant making SC reels is very suspect, but there are some factories there which do a good job, Maxell for instance, Van Staal, Penn Fathoms... In general, put Taiwan well ahead of China for manufacture of reels unless there is some strict control and price less the major determining factor in production. The PG's feel solid, drag works very well - smooth progression through it's range. One question another person raised had to do with the drag system. Drag washers are large, more like a 4/0 size. The 40/50 are "dry" the two new small sized reels will be "wet." Still have some at our HB location, but they will be gone. Here's the dilemma I'm in with PG. The fellow behind them had a heart attack while fishing back in September. Family want's him to slow down. We talked, he's playing with another model which may come into market after January. That would make three series of reels in about 2 years time, confusing to the market. A few months back I suggested dropping the retail price of their current models. With that done, at $200, they are fine reels and a great buy. But, I'd also heard from a couple clients of ours who tried to contact PG thru their website's contact form with no responses. Turns out, according to the firms owner, he does not get those emails, they go nowhere abut to space. So, clients don't get issues resolved, don't have a way to contact manufacturer. That's not good, no company should operate that way, and it gave me serious concern for the future. Given some new models coming, Okuma will have a new star drag to replace the Cedros models... The Okuma piece will retail at a good price, will no doubt be of better quality with a three year warranty. That will be the better option for many, even at a somewhat higher price. As a retailer, seems a better place to put our inventory dollars and a safer bet for the consumer long term. That thinking caused me to pull back the inventory from our SD shop, clear our shelves and hold off promoting the PG product until the future is clearer. Quick Reply to: PRO GEAR IS BACK!